Illustration c1997 Kelley & Mouse/GDM, Inc. Thanks To: Grateful Dead Crew and Office Staff, Grateful Dead Merchandising, Club Front, Ice Nine Publishing, and Deadheads Everywhere! 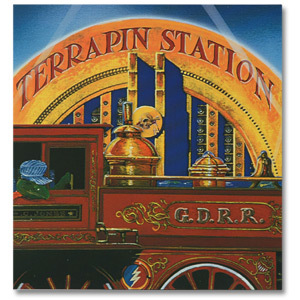 Terrapin Station (Limited Edition) is an uncut release of 3/15/90 at the Capital Centre, Landover, MD. Only 25,000 copies of this album have been released and each copy is numbered. All proceeds go towards the Terrapin Station Project. It was released in October 1997. This show also happened to fall on Phil Lesh's 50th birthday.